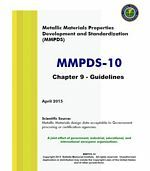 Chapter 9 is the "rule book" for MMPDS. Since 1966, these guidelines have described statistical procedures used to calculate mechanical properties for alloys included in the Handbook. Chapter 9 is divided into subchapters that cover the analysis methods used to define room and elevated temperature properties. The room temperature mechanical properties are: tensile, compression, bearing, shear, fatigue, fracture toughness, elongation and elastic modulus.